Things are upside-down in LazyTown. 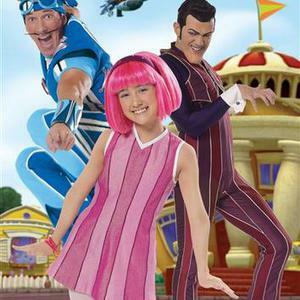 Stephanie, an optimistic girl with bright pink hair, comes to live in LazyTown and meets a zany mix of townspeople, including the world's laziest super-villain, Robbie Rotten. Fortunately for Stephanie, LazyTown is also under the watchful eye of Sportacus, an athletic, super-active SuperHero, who runs, jumps, flips and flies to the rescue in his futuristic AirShip ? he always manages to save the day and to help the kids of LazyTown foil Robbie's latest lazy schemes. The other kids of LazyTown are inquisitive, adventurous, playful, and like Stephanie and most other kids, just trying to figure out their own worlds. Each of them has strengths and weaknesses that all children can identify with. Originating in Iceland, LazyTown currently airs in over 150 countries around the world, including Sprout in the US and Cartoonito in EMEA.